Both payment delays and insolvencies are expected to increase in the coming months as decreasing investments and lower production will impact suppliers. According to the International Organization of Motor Vehicle Manufacturers OICA, in 2017 UK automotive sector output decreased 3.7% to 1.75 million vehicles produced. Reduced demand for diesel engines due to uncertainty about regulation and taxation surrounding the government’s plan to cut CO2 emission targets led some car manufacturers to cut production. According to the European Automotive Manufacturers Organisation, ACEA, in 2017 new passenger car registrations increased 3.4%, while commercial vehicle registrations fell 4.4%. Domestic new car registration decreased 6% in H1 of 2018 according to the Society of Motor Manufacturers and Traders (SMMT), due to ongoing uncertainty about Brexit and the government´s plans for emission reduction. That said, exports continued to sustain automotive production growth, helped by a weaker pound. Exports account for around 80% of production, with the EU being the biggest export market, accounting for 54% of exports in 2017. According to SMMT, investment in the British automotive sector continued to decrease, from GBP 1.7 billion in 2016 to GBP 647.4 million in H1 of 2017 and further to GBP 347.3 million in H1 of 2018. This decline in investment reflects the ongoing uncertainty of businesses over the outcome of Brexit. As UK automotive manufacturers require access to free and frictionless trade with the EU, there is concern that manufacturers could decide to divert further investment outside the UK. A “hard Brexit” outcome (ending access to the single market and customs union) without any interim arrangement would severely hurt producers and suppliers alike. Leaving the EU could mean that increased tariffs would make producing cars in the UK more expensive. Under World Trade Organization (WTO) rules, there would be a tariff of 10% on vehicles and 4.5% on components. The introduction of customs controls would hamper the just-in-time delivery of parts from EU suppliers, and lead to higher stocks, thereby increasing costs as on average, UK-made cars contain approx. 60% of components imported from the EU. In addition to any potential trade disruptions, the sector would lose benefits from EU funds for manufacturing research and development. Foreign-based car producers with operations in the UK could suffer from a deterioration in profits and an impairment in assets. Currency volatility continues to be an issue. While the depreciation of the pound has helped exporters, it has also pushed up the cost of importing both vehicles and components. Approximately 82% of domestic-sold vehicles and 60% of automotive components are imported from the EU. The recent decrease in new car registrations due to weaker consumer and business confidence will require dealers and manufacturers to absorb a share of those increased costs, which could negatively impact their margins. Payments in the UK automotive industry take 60 days on average. 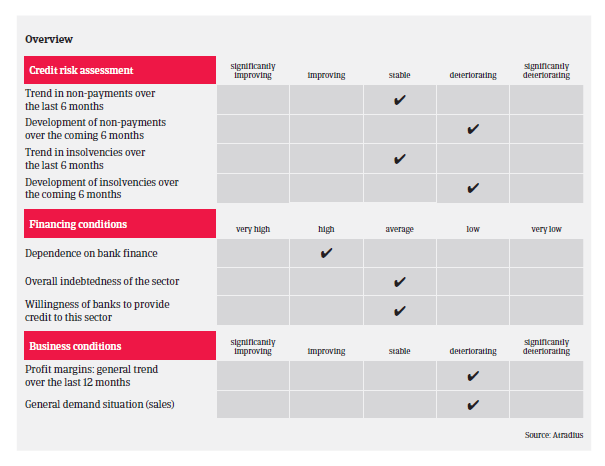 We expect that both payment delays and insolvencies will increase in the coming 12 months. Lower production will impact suppliers, particularly those that had invested in expanding their facilities expecting that robust growth would continue. The decrease in domestic car sales is impacting profits of new car dealerships, with some having to restructure and downsize. 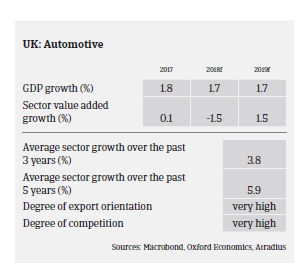 For the time being, our underwriting stance remains ‘open to neutral’ towards the UK automotive sector, due to the persistent strength of the British car manufacturing industry (its diversity, with a reasonable mix of volume, premium and specialist producers), the still satisfying output (compared to pre-2016 production levels) and robust export demand. 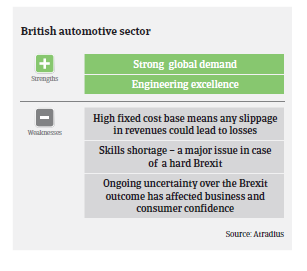 However, while the true implications of Brexit for the UK automotive sector remain uncertain, we continue to monitor closely the ongoing negotiation process and may adapt our position in the future if the environment changes significantly. Meanwhile, given that sales to US account for 14.5% of UK automotive exports, there is also a concern that any US punitive tariffs on automotive imports could affect the sector’s performance. 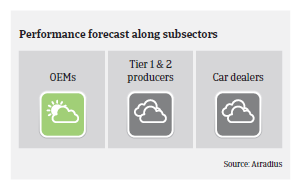 Good short-term outlook for the chemicals sector, but Brexit poses a downside risk for businesses profitability and payment behaviour in the mid-term. After a slight decrease in sales on credit terms in 2016 (44.3%), the total value of B2B sales on credit in Great Britain increased again this year (45.7%). Despite increasing challenges a recovery of the exchange rate and a rather stable economic outlook for 2018 should help the ICT industry in the short-term.